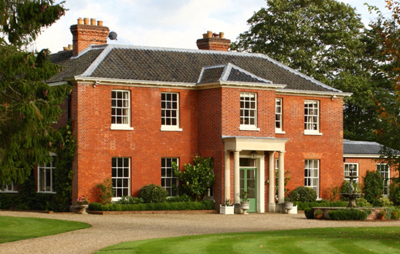 The new mood of realism pervading the East Anglian market is reflected in the £2.5 million guide price quoted by Savills (01473 234830) for elegant Bretteston Hall at Stanstead, near Long Melford, Suffolk, which is being relaunched onto the market in this week’s Country Life, having failed to sell at ‘excess £3.5m’ in 2011. The imposing, Queen Anne-fronted former rectory, listed Grade II, was originally built in the early 17th century- a carved frieze in the reception hall is dated 1617-and extended in the 18th and 19th centuries. 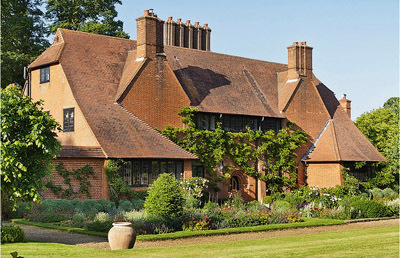 Sir Edwin Lutyens is thought to have added the bay windows in the dining room and drawing room in the 1920s. Having bought the hall in a state of ‘shabby chic’ in 2003, owners James Horne and his wife, Alison, have re-created a grand country house of rare distinction, with four main reception rooms, three bedroom suites and four further bedrooms; the former coach house has been converted to a one bedroom cottage. Bretteston’s 24 acres of grounds surround the house and include splendid formal gardens attributed to Gertrude Jekyll and two walled gardens-one a period piece, the other a working kitchen garden established by the present owners. Knight Frank are joint agents with Strutt & Parker (01473 220444) in the sale, at a guide price of £2.75m, of peerless Woolverstone House, believed to be the only complete work by Lutyens to be found in Suffolk. On the scenic Shotley peninsula, bordered by the River Orwell to the north, and the Stour to the south, it was built in 1901 by Charles Berners as a convent rest home. It was then used for a variety of institutional purposes until the 1980s, when it became a private family home. Built in Lutyens’s trademark Arts and- Crafts style of red brick with cat- slide roofs and leaded-light windows, the house has been painstakingly renovated by the current owners, for whom it has been a much-loved weekend retreat. It has a generous 8,415sq ft of accommodation, including three reception rooms, a billiard room, a kitchen/breakfast room, various offices, 10 bedrooms, six bathrooms, a fitness room and a gym. Woolverstone’s four acres of gardens, reputedly designed by Gertrude Jekyll, have been spectacularly restored, and now include a swimming-pool garden and a separate area with a tennis court and football pitch. An additional five-acre field in the village is also available if required. The pretty village of East Bergholt on the northern side of the lovely Stour Valley was the birthplace of John Constable in 1776, and the place where he lived and painted many of his finest works. Another important Suffolk house to hit the market in recent days, prestigious, Grade II listed Ackworth House at East Bergholt, built in about 1840, was the country seat of Sir Thomas Seaton in the late 1800s, and the family home of the eccentric artist Lucy Harwood, from 1904 until 1940. 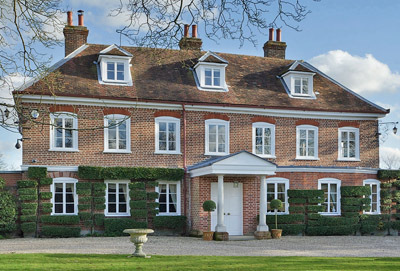 More recently, the gracious, 48-acre, perfect small country estate was home to the late Roy Grier, the well-known East Bergholt estate agent, whose family firm, Grier & Partners (01206 299222), is now handling the sale of the house, jointly with the Ipswich office of Jackson-Stops & Staff (01473 218218), at a guide price of £3.85m for the whole. The sale includes the gate lodge, a cottage annexe, a three-bedroom gardener’s cottage with planning consent to extend and a range of outbuildings. Inside and out, the two-storey white brick house exudes understated charm. A galleried entrance hall leads to the drawing room, dining room and library on the south side of the house, overlooking the gardens and the Dedham Vale. The staircase hall leads to the sitting room, the breakfast room and the kitchen, and upstairs to the main bedroom suite and six further bedrooms, all with views over Ackworth’s parkland and fields. The house stands well within its own grounds on the edge of the village, surrounded by beautifully maintained formal lawns and gardens that include a walled garden planted to provide flowers for most of the year, a productive kitchen garden and a central croquet lawn. 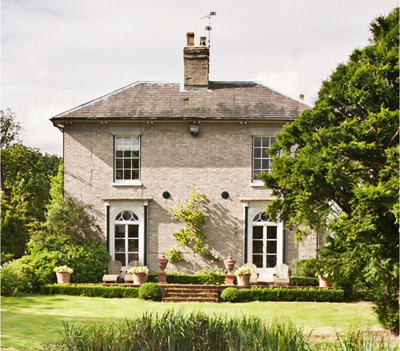 Good things seem to happen in threes for Louis de Soissons, Savills’ country-house supremo in Norfolk. Not only is he launching three of the county’s most appealing Georgian houses onto the market this week, but he’s already sold each one of them on two previous occasions. Savills (01603 229229) quote a guide price of £2.85m for imposing Guist Hall, the former dowerhouse to the nearby Sennowe estate, which stands in 10 acres of formal gardens, grounds and woodland, to the north of Guist village, and a handy 10 miles from Holt, six miles from Fakenham and 13 miles from the north Norfolk coast at Cley-next-the- Sea. A handsome late-Georgian house with additions executed for Edmund and Harriet Prestor in 1871, the hall is, surprisingly, unlisted, but has all the attributes of a house of the period, including bright, well-proportioned rooms, fine chimney pieces, panelled doors, moulded cornicing and shuttered sash windows. Although the house has been well maintained throughout its life, the present owners, who bought it through Savills in 1997, have conducted a thorough programme of modernisation and refurbishment, including the creation of a two-bedroom guest annexe on the ground floor. Accommodation includes entrance and staircase halls, five reception rooms, a kitchen/breakfast room, various utilities, eight bedrooms, seven bathrooms, four dressing rooms and an office. A separate cottage with its own garden adds three bedrooms, two reception rooms and a kitchen. A few miles south of Guist, Grade II-listed Twyford House at Twyford, 12 miles from Holt and 17 miles from Norwich, is another handsome late-Georgian country house that has been comprehensively renovated by the present owners, who are now spending more time in London, where they plan to buy a larger house, and downsize to a smaller second home in the country, hence the sale of Twyford House through Savills at a guide price of £1.5m. 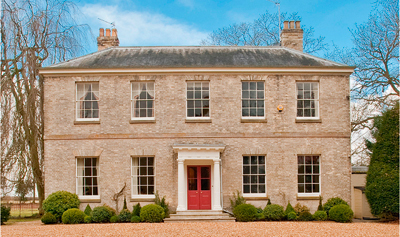 With four main reception rooms, a kitchen/dining room, a ground-floor guest wing, seven bedrooms and five bathrooms, Twyford House is equally ideal as a full-time family home, a commodity much prized by parents of school-age children in this part of Norfolk. The six acres of wooded gardens and grounds surrounding the house have been landscaped and replanted with a variety of shrubs and trees. The traditional brick-and flint barn and outbuildings have also been re-roofed and planning consent (now lapsed) was obtained in 2005 to convert these buildings to a separate five-bedroom property. 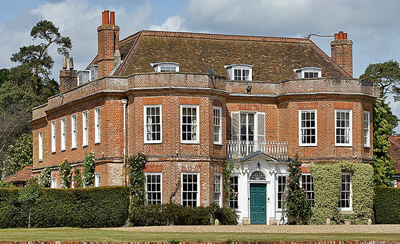 The third of Mr de Soissons’ trio of Georgian gems is The Manor House at Coltishall, seven miles north of Norwich, which stands in a wonderful setting on the banks of the River Bure, with its own quay heading, mooring and boathouse. The Manor House at Coltishall, seven miles north of Norwich, stands in a wonderful setting on the banks of the River Bure, with its own quay heading, mooring and boathouse. The classically proportioned main house, built in about 1723 with later additions and alterations, has four main reception rooms, a garden room, a kitchen/breakfast room, a games room, seven bedrooms and three bathrooms, plus outbuildings, a studio and a thatched summer house. Gardens and grounds of almost 14 acres create a splendid setting for the house, on the market at £1.85m, which is surrounded by lush lawns and magnificent mature woodland. The sale includes Manor Court, a secondary three-bedroom house built for the owner’s mother, which has its own separate access and garaging. 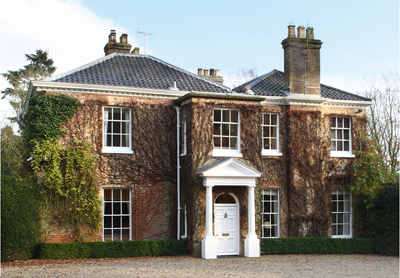 Alastair Brown of Strutt & Parker‘s Norwich office (01603 617431) has also chosen this week’s Country Life as the launchpad for his first major country-house sale of the year. He quotes a guide price of £2.275m for The Old Rectory at Elsing, a rare, 73-acre, mid-Norfolk country estate on the banks of the Wensum, within the increasingly favoured Fakenham-Dereham-Norwich golden triangle, as a whole or in three lots. The historic former rectory, listed Grade II, was built by the Rev John Robinson, a flamboyant character who came to Elsing in 1616-finding the existing rectory in a dilapidated state, he rebuilt the present house on the site. The 17th-century timber frame has since been replaced by a brick façade and the two-storey building has four reception rooms, a kitchen/ breakfast room, six bedrooms, four bathrooms and four attic rooms. Outbuildings include stabling, a coach house, garaging and kennels, and a separate, Grade II-listed cottage. Also in Suffolk is Grade II*-listed Langham Hall at Langham, 10 miles from Bury St Edmunds, another hidden Georgian gem with far-reaching views over 98 acres of formal gardens, parkland, paddocks and river meadow, and now for sale through Savills (01473 234830) at a guide price of £2.75m. The seat of the Blackwell family since the early 1920s, the hall was built in about 1756 and has 10,470sq ft of accommodation on three floors, including an imposing entrance and reception hall, three main reception rooms, numerous domestic offices, a dog room, extensive cellars, a large master suite, 10 further bedrooms and five bathrooms. A little gentle updating wouldn’t go amiss. Secondary buildings include a three-bedroom bungalow, the award-winning Langham Court offices built in 2000 and let on a commercial lease until 2016, and a two-bedroom garden cottage with its own drive and garage. Amenities include a heated outdoor pool, an all-weather hard court surrounded by a 12ft Georgian red-brick wall, and a magnificent walled garden that houses the national collection of Alpine campanulas, two grass tennis courts and a professionally managed kitchen garden. A steal for London commuters? As a West Country man, Christopher Dewe of Knight Frank has been amazed at the ‘value for money and excellent communications with London’ to be found in the ‘forgotten’ counties of East Anglia. He’s excited to be involved with this week’s launch of two highly commutable new entrants to the market, the Georgian, Grade II-listed North End Place at Brook Hill, near Felsted, Essex, and Lutyens’s ‘secret masterpiece’, Grade II*-listed Woolverstone House, at Woolverstone. Knight Frank (020-7861 1505) quote a guide price of £2.95m for North End Place, which was bought as a ‘wreck’ by its current owners some 15 years ago. Over time, they have completely restored the classic Georgian house, set in 6.2 acres of gardens and grounds within sight of Felsted village church, and 10 miles from Chelmsford, with London-Liverpool Street station a mere 35-minute train ride away. North End Place has three main reception rooms, a kitchen/breakfast room, extensive cellars, five bedrooms, three bathrooms and extensive cellars. Amenities include former stabling and a gym, plus an outdoor swimming pool and an all-weather tennis court.